When it comes to the work of Brooklyn-born jazz pianist and composer Randy Weston, the discussion is naturally about Africa, a continent that he has a long association with over a career of more than six decades. In his travels dating back to the early 1960s, the musician has visited 18 African nations and lived in Morocco, where he founded a jazz club in Tangier. Mr. Weston, a Clinton Hill resident for nearly 50 years, recounts his musical explorations and travels in his recently-published memoir, “African Rhythms,” co-written with Willard Jenkins. Simultaneously, Mr. Weston has released a live album, “The Storyteller,” recorded with his African Rhythms Sextet at New York’s Dizzy’s Club Coca Cola last year. Mr. Weston grew up in Bedford-Stuyvesant with a father who instilled a sense of African pride, and he recalled his encounters, as a young person, with Brooklyn’s jazz musicians and other artists. In the book, Mr. Weston writes about one of his major influences, the legendary jazz pianist Thelonious Monk, whom he first saw play with saxophonist Coleman Hawkins on Manhattan’s 52nd Street. At first, Mr. Weston wasn’t impressed by Monk’s music, he said, but he later became an admirer. Last month, Mr. Weston performed “Uhuru Afrika” at the BMCC Tribeca Performing Arts Center to honor the work’s 50th anniversary. In 1961 Mr. Weston embarked on his first visit to Africa as part of a cultural exchange program with other musicians. He still remembers the feeling when the plane first landed in Nigeria, he said. Mr. Weston then settled in Morocco for a couple of years, where he became immersed with the music and culture of the Gnawa people. As a tribute to them, he wrote the composition “Blue Moses,” inspired by a Gnawa song. However, Mr. Weston writes in the book, he couldn’t perform “Blue Moses” in public because the Gnawa chief considered the song sacred. A year later, the chief changed his mind after some persuasion by the pianist. In the last five years, Mr. Weston has performed in Japan, Russia, Rwanda and Panama, where his father is from. He hopes to visit Africa again. Randy Weston will take part in Jazz at Lincoln Center’s Listening Party event on Dec. 7 at 7 p.m.; free admission. Mr. Weston will also perform at the Brooklyn Museum on Dec. 12, from 3-5 p.m.; $15. 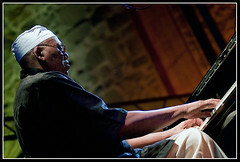 For more information on Randy Weston, visit http://www.randyweston.info.